"For this SG, the voice brick is missing. Does the create brick is ok to represent the idea to draw lines in order to link different points?" "Each minigame features a different gameplay combination: the goals are always MATCH or/and AVOID, associated to a single mean at once among WRITE, SELECT and MOVE." A collection of minigames suited for cerebral training. 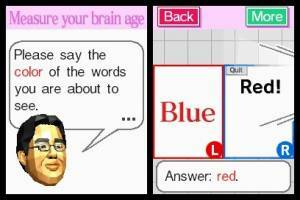 This serious game is design to motivate the players to perform a daily training, in order to improve their "brain age". The featured minigames range from mental arithmetic to reading exercices and logic-based tests.